As the days grow shorter and the air becomes cooler, please don’t forget to remain vigilant about protecting your skin from the sun’s harmful rays. It is just as important to use sunscreen in the fall and winter as it is during the summer. I will never forget the time that it was cloudy and overcast outside and so I didn’t think we needed to use sunscreen on our young children (babies at the time). When we got home we were so surprised that they had a suffered a noticeable sunburn. That was my lesson to always remember that year round sunscreen protection is a must for my family. Coppertone provides a full line of sun protection including products that provide light weight but equal protection against the sun’s UVA and UVB rays. 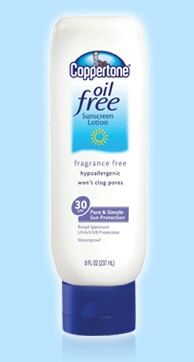 For example, Coppertone Oil Free Facial sunscreen lotion in SPF 30 is lightweight, hypoallergenic and won’t clog pores. It is formulated specifically for delicate facial skin. I liked that it absorbed very quickly and did not have a greasy feeling at all. 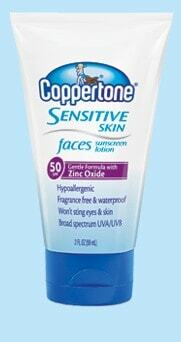 Coppertone Sensitive Skin Faces sunscreen lotion in SPF 50 is formulated with zinc oxide and is my choice for my children’s faces. It didn’t sting their eyes and it was fragrance free and waterproof. Coppertone also has lip care products that contain chapstick and SPF together to protect your lips from the dry air and harmful rays. My father has battled sun cancer for years and believe it or not the lips was the first place that it was diagnosed. When you head outside to enjoy the fall and winter weather and sports…..don’t forget to protect yourself and your family with Coppertone.